Emperor penguins are doting parents from the moment their egg is laid, long before it hatches. They have to be, for the chick to survive -- they breed during the winter, and the egg must incubate in harsh weather. After the egg hatches, the chick's parents continue taking care of him for several months, until he is grown enough to learn to hunt for his own food. 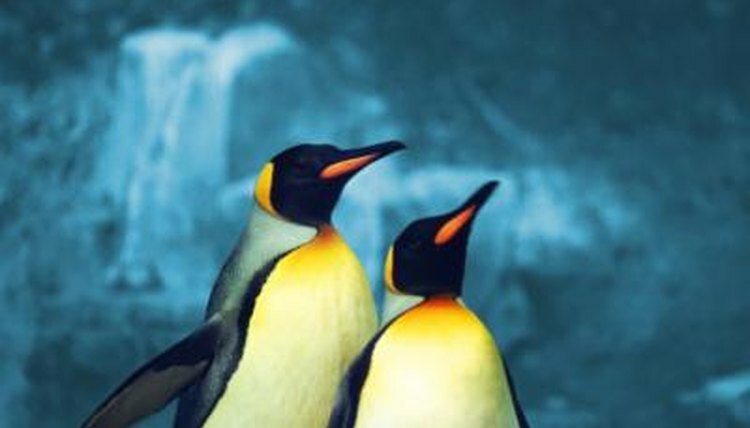 Emperor penguins always breed during the Antarctic winter, laying their eggs in May. After the female lays her egg, she passes it off to the male, who keeps it warm by tucking it under a pouch of skin above his feet. He balances the egg there for about 64 days, during which time the female travels to the ocean to hunt. The male huddles with the other males in his colony, and they help each other stay warm while they fast, incubate their eggs and dutifully wait for their partners to return. The colony's females return around the time that the eggs hatch, with bellies full of food to feed their young. They take over caring for the hatchlings, regurgitating the food they caught while the males travel to the ocean for their first meal in more than 100 days. For the next 50 days or so, the parents continually switch back and forth, one hunting while the other stays with and feeds the chick. When the chick is about 2 months old, he starts spending more time away from his parents, though he still depends on them for food. The parents leave him in a group of chicks called a creche, which is supervised by other penguins in the colony. They can then go hunt together; this is not as time-consuming as it was during the winter, as the warmer spring weather brings the shoreline closer to the colony's nesting site. When the parents return to the colony, they reunite with their chick to regurgitate for him. At the beginning of summer, the colony's chicks become fully independent and the colony travels as a group to the sea for hunting. Because emperor penguins breed and incubate their eggs during the harsh winter, the young are old enough to transition to independence during summer, when food is most abundant. At this point the chicks are about 150 days old and only beginning to lose their fluffy down feathers, but they are mature enough to no longer depend on their parents, and they learn to hunt and feed themselves.